The differences in concentrations of particular substances provide concentration gradients that cells can use to perform work. A concentration gradient is a form of potential energy, like water above a dam. When water falls through a dam the potential energy is changed to moving energy (kinetic), that in turn is captured by turbines. Similarly, when an electrolyte at higher concentration in the extracellular fluid is transported into a cell, the potential energy is harnessed and used to perform work. Cells are constantly transporting nutrients in and wastes out. How is the concentration of solutes maintained if they are in a state of flux? This is where electrolytes come into play. The cell (or more specifically the numerous sodium-potassium pumps in its membrane) continuously pumps sodium ions out to establish a chemical gradient. The transport protein, called the glucose symporter, uses the sodium gradient to power glucose movement into the cell. Sodium and glucose both move into the cell. Water passively follows the sodium. To restore balance, the sodium-potassium pump transfers sodium back to the extracellular fluid and water follows. 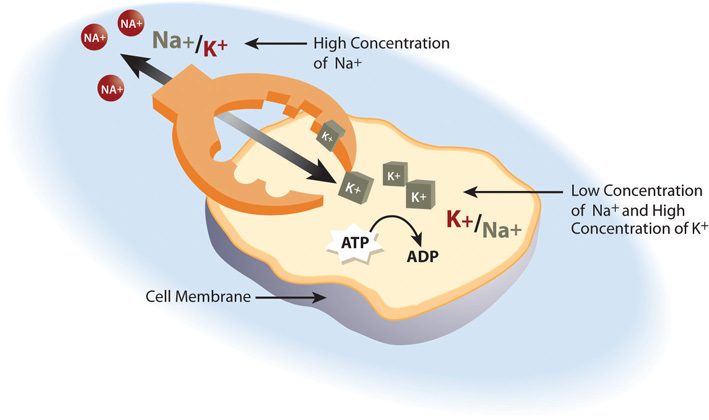 Every cycle of the sodium-potassium pump involves the movement of three sodium ions out of a cell, in exchange for two potassium ions into a cell. To maintain charge neutrality on the outside of cells every sodium cation is followed by a chloride anion. Every cycle of the pump costs one molecule of ATP (adenosine triphosphate). The constant work of the sodium-potassium pump maintains the solute equilibrium and consequently, water distribution between intracellular and extracellular fluids. The sodium-potassium pump is the primary mechanism for cells to maintain water balance between themselves and their surrounding environment. Electrolytes Important for Fluid Balance by University of Hawai’i at Mānoa Food Science and Human Nutrition Program is licensed under a Creative Commons Attribution-NonCommercial-ShareAlike 4.0 International License, except where otherwise noted.